Sarah wrote a great blog post on how to ace a job interview and listed “Where do you see yourself in 5 years” as one of the most dreaded interview questions. I’ve been thinking about that question since I read her post and wondering how I’d answer it. She offers some great tips, suggesting that it’s important to allow yourself some leeway and forgiveness for changing course when life happens. I totally agree with her. I also think it’s a fair question, one that we should probably ask ourselves more often than we do. Summer seems like a good time to do this. Life is a bit slower and easier in the summer, the days longer, our work lives a bit quieter without students in the mix. Maybe it’s a perfect time to reflect on the big picture. My first thought was “Oh, I know! I’ll write a blog post about how to write a 5 year career plan and stick to it!” but quickly realized that I had neither the desire nor credibility to write that blog post. No desire because I’m working hard to release the tyranny of perfection and rigidity that would run my life if I let them (and, believe me, they have). No credibility because, if I had written a 5 year plan 5 years ago, I promise you it wouldn’t have me where I am now (which is, not for nothin’, happy and content). Then I thought, “Oh, I know! I’ll write a blog post about how to hack a 5 year career plan!” but quickly realized that I didn’t want to write that post either. Because really, we shouldn’t be hacking everything. Especially our life’s trajectory. That seems like maybe something we should be fully mindful of and intentional with given that it is, you know, sort of important. So what exactly is the blog post I want to write? If it’s not about nailing it, and it’s not about bluffing it, maybe it’s a little bit about looking backwards and a little bit about dreaming big and probably quite a lot about knowing when to hold ’em and when to fold ’em (man. I used to LOVE that song.). So, in that spirit, here’s a thought exercise that you can do in as little as 5 minutes or as long as 5 hours or even 5 days. What were you doing 5 years ago? How did you feel? Were you blissfully happy? Miserable? Somewhere in between? Sometimes 5 years ago can feel like forever, and sometimes it can feel like a heartbeat. When I look at myself 5 years ago, I see a working mom of a 6 year old and an almost-3 year old who was mostly Just Plain Tired. I’d been a practicing SLP for 10 years at that point, and somehow I had gone from the wide-eyed noob to something approaching a seasoned veteran. Did I still want to be an SLP? 100% yes. Did I want to do it the way I saw some people do it, settling into complacency and bitterness? 100% nope. Looking back at our former selves can offer us a chance to reflect on the growth that is sometimes too incremental to see on a day-to-day basis. Or, maybe, on the lack thereof. Which brings me to . . .
5 years from now, do you want to be where you are right now? I mean, not like, literally. But generally speaking, if you woke up in the morning and it was 5 years from now, how would you feel about that? Would you still want to be in your position? In your district? Taking an honest look at our current situation and answering these questions helps shape our next steps. If we’re quite content where we are, we might benefit from thinking about what we can do to grow deeper roots and stay engaged and passionate about our work. If, on the other hand, the thought of waking up 5 years from now in the same place feels more like a nightmare, it’s probably time for us to think about what we can do to make some significant changes. 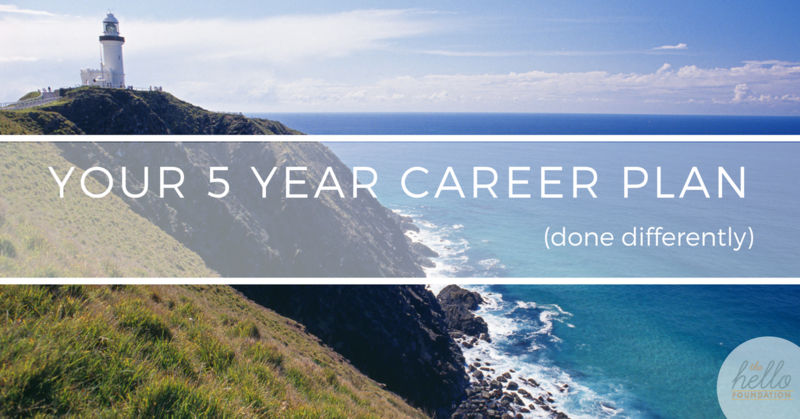 If your wildest professional dream came true, where would you be in 5 years? This, I think, is the fun part. We can give ourselves permission to be audaciously ambitious, to call the moon shot, to dream the big dream. It’s not really about setting a goal, per se, but more about spending some time checking in with what’s inside our heart of hearts. This is when we can say out loud that we want to move up, move out, or move on. The value in doing this step is that it gives us a lighthouse in the distance by which to guide our ship. We can make decisions by filtering them through the does-this-opportunity-align-with-my-big-dream lens. If the answer is yes, then we know it’s something we should do. If the answer is no . . . well, that’s something we have to think long and hard about. What is my 5 year career plan? The honest answer is that I don’t really know. I quite like my professional life at the moment and would be happy to continue on my current trajectory, but who knows what the future holds. What I do know is that my Big Dream is to make significant positive contributions to the lives of kids with disabilities and to the cause of equity in public education. As long as I can look at myself in the mirror in 5 years and know that I am working towards that end, I know I’ll be happy.